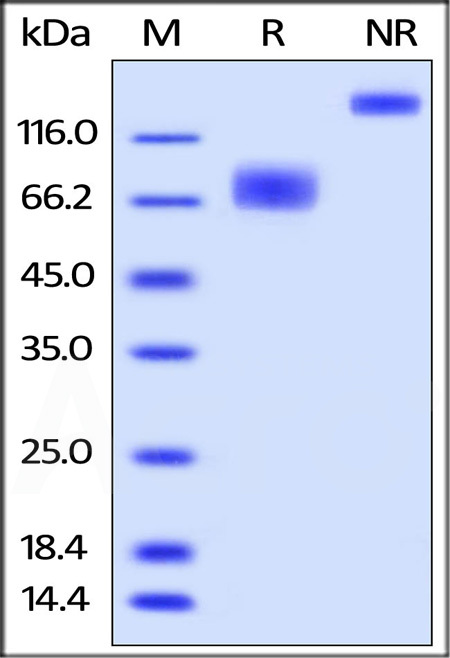 Biotinylated Human 2B4, Fc Tag (2B4-H82F0) is expressed from human 293 cells (HEK293). It contains AA Cys 22 - Arg 221 (Accession # NP_057466.1). The protein has a calculated MW of 50.7 kDa. As a result of glycosylation, the protein migrates as 65-80 kDa under reducing (R) condition, and 130-160 kDa under non-reducing (NR) condition (SDS-PAGE). Biotinylated Human 2B4, Fc Tag on SDS-PAGE under reducing (R) and non-reducing (NR) conditions. The gel was stained overnight with Coomassie Blue. The purity of the protein is greater than 95%. 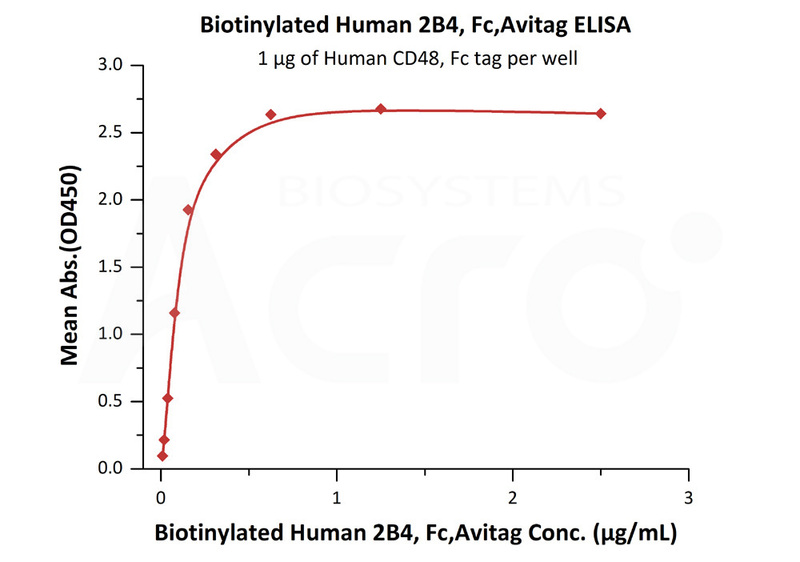 Immobilized Human CD48, Fc tag at 10 μg/mL (100 μL/well) can bind Biotinylated Human 2B4, Fc Tag (Cat. No. 2B4-H82F0) with a linear range of 0.01-0.156 μg/mL (QC tested). Natural killer cell receptor 2B4 is also known as NK cell type I receptor protein 2B4 (NKR2B4 or h2B4), SLAM family member 4 (SLAMF4), Signaling lymphocytic activation molecule 4, CD antigen CD244. NKR2B4 / CD244 contains two Ig-like (immunoglobulin-like) domains. CD244 is expressed in spleen, PBL, followed by lung, liver, testis and small intestine. CD244 interacts with CD48. Following phosphorylation, CD244 is able to recruit PTPN11/SHP-2 and SH2D1A/SAP. SLAMF4 modulate other receptor-ligand interactions to enhance leukocyte activation. CD244/2B4 is the only heterophilic receptor of SLAM family. (1) Nakajima H., et al., 1999, Eur. J. Immunol. 29:1676-1683. (2) Kubin M.Z., et al., 1999, Eur. J. Immunol. 29:3466-3477. (3) Boles K.S., et al., 1999, Tissue Antigens 54:27-34.